The Solar System has eight planets, smaller dwarf planets (like Pluto), and a star. Between the fourth (Mars) and fifth (Jupiter) planets is a special place. Astronomers call this region the asteroid belt because there are millions of tiny asteroids in this region. These objects circle the Sun just like a planet might. Sometimes they fall out of orbit and head towards the Sun, crossing the orbital path of the Earth. 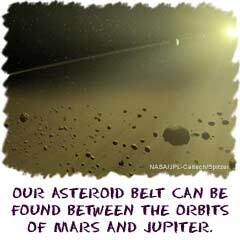 As we said, the asteroid belt is made of millions of pieces of rock and dust. There could be over 40,000 larger ones. The largest discovered asteroid is about 900 miles across. As time passes, the size of the asteroids will decrease. As they orbit the Sun, they constantly hit each other and break into smaller pieces. Those collisions are sometimes the cause of asteroids being knocked out of orbit. Astronomers think that the asteroids are leftover pieces of the Solar System. As other large objects in the system combined to form planets, there were some smaller pieces left over. Their location between Mars and Jupiter could also influence the pieces. They may have never formed a very small planet because of the gravitational pull from of Jupiter (very strong) and Mars (very weak). The pulling of the two planets keeps the asteroids separated and circling the Sun in a doughnut shaped area. Astronomers think there may be other very small asteroid belts in our system. Many small pieces of rock are in orbit between Earth and Mars. There are also pieces in orbit between Mercury and the Sun. The smaller fields are not as large as the one outside of Mars, but they do seem to hold a larger number of asteroids than the very empty areas of the Solar System. There are even hints that other systems have similar fields of asteroids.